If you have a small laundry space, a desire for a second washer and dryer solution in a large home, or you want to replace a strangely shaped and outdated laundry setup, a compact washer and dryer might be perfect for your needs. These smaller, more space-efficient apartment size washer and dryer combos offer a range of benefits over their larger counterparts. Your laundry room or laundry closet is extremely small. Whatever your reasons, a compact washer and dryer set can be a powerful solution for space requirements. That being said, many buyers have no idea that compact systems even exist. If they do, they often don’t know how to identify the best apartment size washer and dryer sets, which brands are best, and what to expect when compared to full-size domains. Difference between venteless dryers - condensing, heat pump etc. So, let’s get right into it. What do you need to know before buying a compact washer and dryer set? This list highlights the ten most important things you’ll need to consider before you dive in and buy a compact washer and dryer. This is a crucial but often overlooked part of measuring for your new compact washer and dryer set (as most of us put away the measuring tape after we verify the width alone). Many old washers were much more shallow than newer models, even the compact ones. It’s important to measure your space for width, height and depth and compare those measurements to any apartment size washer and dryer you’re considering. If the measurements line up, then you’ll be good to go. If your space is too small, you might need to find another solution. Many brands have switched to ventless electric dryers nowadays, which feature 208/240V (we often just denote this as 220V in our articles as 208V is usually observed in industrial settings and 220V is a more common residential term). The majority of compact dryers require 220 volts in order to operate. In the US, 110V electricity is the standard in most homes. So why do electric dryers need 220V power? To put it briefly, the dryers require a higher power level and manufacturers want to ensure that their machines can operate effectively and efficiently. Make sure that the location where you want to hook up your machines has the proper power lines for this requirement. Otherwise you’ll find yourself with a brand new washer and dryer and no way of powering it. If you don’t already have a 220V electric line installed, you’ll need to have one installed by a professional electrician before you can begin using your compact dryer. Two notes—Miele is the only brand whose dryers don’t require 220V power. Meanwhile, Bosch and Blomberg washers plug directly into the dryer, and then receive power through the dryer’s plug in the wall. As a result, Bosch and Blomberg products must be used in a set—they cannot be interchanged with other brands. Finally, you may be able to find older models that use 110V power if you’re adamant about not wanting to have a new line installed in your laundry room or closet. Having said that, the cost of having an electrician install a 220V line is relatively inexpensive and may be worth the ability to install a brand-new model with advanced, modern features. You might be wondering whether it’s possible to replace just one machine in your washer and dryer set for a newer model? For example, if you’re happy with your current washer but the dryer isn’t getting the job done, can you keep the washer and swap in a new dryer? The short answer? It depends. For stacking sets, each apartment size washer and dryer has a specific partner and stacking kit. Your safest bet is to contact either the manufacturer or salesperson directly to find out which pieces are compatible with which partners. That way you won’t be caught by surprise when you bring home a new dryer only to find it's not compatible for stacking with your current washer. A stacking kit is a set of hardware that allows a dryer to be stacked on top of a washer safely and securely. You might think that you can just stick a dryer on top of a washer if it fits, but that is an unsafe and unwise choice. Both washers and dryers feature rotating drums, which means that leaving them unsecured can result in a catastrophe if one falls of the other or comes loose. Your best bet is to choose a stackable apartment size washer and dryer set based on manufacturer recommendations, and use their recommended stacking kit to get the job done. Some stacking kits even feature drawers where you can store cleaning supplies. That being said, their main purpose is to reduce vibration, distribute weight evenly and allow you to operate your washer and dryer safely. This might seem simple, but you’d be surprised by how many buyers overlook the direction that their compact washer and dryer doors swing open. These items are designed for small spaces where room is at a premium. If your apartment size washer and dryer set features doors that open the wrong direction, you might be sliding your clothing through a two-inch gap into the machines. While some brands offer bi-directional doors that can be reversed to open from either side, many don’t. Be sure to check the specs before you buy so that you’re not caught with the wrong arrangement. Dryers that use condensers require good air circulation. Without it, rooms can become damp and hot or even overheat. These dryers require an ambient humidity level that’s less than 95%. When it comes to heat pump dryers, this is less of a concern. Take the time to research and understand which type of model your favorite dryer is and what its ventilation needs will be before you buy. Want to decrease your overall drying time when completing loads of laundry? It’s all about the spin rate. That’s right—how fast your dryer spins is one of the leading factors that determines how quickly the clothes inside will dry. A washer at 1600RPM (rotations per minute) or above will significantly shorten drying time. When it comes to apartment size washer and dryer sets, only Miele offers dryers with 1600 RPM capabilities. The rest range between 1200 and 1400 RPM. If you want to minimize dry times as much as possible, consider going for a Miele model. We’ll talk more about the brand later on in this guide. Most compact dryers are ventless, but there are some exceptions. Blomberg, for example, makes some dryer models that feature vents. But what exactly does ‘vented’ mean, and how does it differ from a ventless model? A vented dryer takes in air from outside the machine (your home), heats it up, and then sends that heated air through the laundry before circulating it back outside. An air outlet must be connected to a vent that leads outside—otherwise you’ll experience hot, moist air pouring into your home. Vented dryers often come with cheaper price tags but relatively high operating costs. Generally, ventless dryers are even less efficient than vented dryers, using a heat exchanger to cool off hot air after a cycle. But with new Heat Pump Technologies, ventless dryers become dramatically. More efficient—as much as 50% more than conventional ventless models. Ventless models work by heating the air inside the machine to dry clothes, then cooling off the hot air and causing it to condense inside the machine. They then repeat this process. As a result, there’s no need to connect the dryer to a source that leads outside. They can be plugged in and immediately used safely. Nowadays, everything that can be connected to the internet will be connected to the internet. That includes apartment size washer and dryer sets. It’s no wonder, either—connectivity has become a huge part of making our daily lives more convenient. Appliance manufacturers are following this trend and developing dedicated mobile applications for controlling and monitoring their machines. For washers, users can now monitor the wash cycle as it happens. They can even get alerts about potential problems with the machine, how much detergent is remaining in the tank, and with certain brands like LG, they can even download new wash cycles. This technology is certain to be improved even more as connected washer and dryer sets become more popular and technology advances along with them. One interesting development in washer and dryer tech has been the introduction of automatic dispensing. Miele allows you to insert a detergent cartridge into your machine, allowing you up to three months before you need to add more detergent. This lazy-friendly feature is taking the washing and drying industry by storm. In the ‘olden days,’ users put detergent in manually. Then came the creation of small automatic dispensers you could load before each load of laundry, evenly dispensing the detergent during the load. Miele has taken this technology a step further, allowing for a large reservoir of detergent that automatically releases the perfect amount for each load. So what exactly is the distinction between a full-size laundry set and an apartment size washer and dryer? A full-size washer or dryer is generally 27” wide, though some specialty options are available that stretch to a massive 29” or even 30”. Talk about mega-sized appliances. Apartment size washer and dryer sets, on the other hand, can be much more compact. They generally tend to feature a width of approximately 24”. However, their washing capacity usually isn’t dramatically lower than their full-size counterparts. While full-size options generally offer 4.5 cubic feet of space, compact units can fit as much as 2.5 cubic feet. Compact washer and dryer sets are most commonly selected for their small profile, perfect for spaces and homes where there’s limited space. But don’t mistake their compact size for being low on features—most are every bit as feature-rich as their bigger siblings. You can even get stackable pairs in compact sizes. Let’s take a quick look at the approximate dimensions of each major brand’s compact washer and dryer. Asko - XL Series 34"x24"x28"
Blomberg - 9800 Series 34"x24"x26"
Based in Germany with over a century of history behind them, Miele is one of the most trusted manufacturers and designers of high-quality appliances. In fact, their designs and build quality are so precise that the company claims a 20 year lifetime for its products, twice as long as the next best brand. Miele’s new W1 series is their flagship compact washer line, and offers a long list of unique features. As a result, we feel confident in saying that Miele’s compact washers are the best currently available on the market. In addition to the 1600 RPM drying speed found in dryers, let’s look at the W1 series’ best offerings. Miele aims to take perfect care of any fabric with the new W1 washer. It features a unique CapDosing option which uses specially formed capsules designed for different types of soiling. There are six categories in total—Sport, Down, Outdoor, WoolCare, SilkCare and Proofing Agent. They also offer three unique fabric softener styles—Aqua, Nature, and Cocoon. With all this customization, it’s easy to see why Miele is so popular. Their machines also offer a Booster option for stubborn stains, and a TwinDos system that stores three months’ worth of detergent and bleach in the machine to be automatically. Released during wash cycles. Other than these unique features, Miele has a blazing fast 1600RPM motor, high-efficiency (HE) detergent availability, customizable programs and all other required functions for perfect cleaning. With all these great features, Miele WWH860WCS is the best compact washer on the market. Like Miele washers, Miele dryers are the picture of perfection. Miele T1 ventless compact electric dryers use energy efficient Heat-Pump technology. They also offer a steam-finish option for easy ironing, automatic cycle that adjusts cycle time and intensity. The FragranceDos feature allows you to use the specially formulated Miele fragrances to freshen up your laundry. Miele TWi180WP has the best compact dryer on the market, and it can be paired with WWH860WCS. Miele washers & dryers also offer Wi-Fi connectivity which allows users to monitor detergent level, wash status, etc. Finally, both washers & dryers have bidirectional doors for increased flexibility and use in a wide range of home setups. For more details, please check our Miele M1/T1 laundry article! Bosch builds excellent quality washers and dryers for all budget levels, and guarantees terrific performance at all levels. Their proven quality in the appliance industry leaves no doubt that this European powerhouse is going to meet and exceed all expectations with its compact washers & dryers. WAT28402UC This machine offers excellent washing performance, along with 15 different cycles including a 15 minute quick-cycle for urgent needs. It is one of the quietest washers available on the market, guaranteed to not disturb you while operating. It also boasts Bosch's AquaStop® Plus feature that detects any water leakage, and will automatically pump out water in order to protect your floor. It's also an extremely energy efficient machine, with ActiveWater that automatically calculates the necessary electricity and water levels for each load. The WAT28402UC can be stacked with the WTG86402UC 24" 800 Series Compact Ventless Electric Dryer. Using condensation drying technology, it is as quiet and efficient as its washer counterpart. Keep in mind, this washer & dryer pair only needs one 220V plug since the washer can be plugged into dryer. The only downside to Bosch models is that they don't allow for liquid bleach. If this is an absolute dealbreaker for you, you might want to consider another brand. Otherwise, Bosch is an excellent, industry-leading company that is worth your consideration. For more in-depth information about Bosch washers and dryers, please check our Bosch Washer & Dryer review. One of the most famous of all companies worldwide, Samsung brings a track record of proven success in the home appliances market and consistently produces stylish, successful products. Samsung currently offers one of the best compact washers when it comes to the value/price ratio. The Samsung WW22K6800AW uses steam power to get rid of stubborn stains without damaging any of your fabric, and boasts 14 wash cycles and 8 selectable options for a wide range of washing power. Samsung even has its own VRT Plus™ Technology for reduced vibration and noise. With self clean options, your washer can wash itself and remove dirt and bacteria for better cleaning results on your laundry. Finally, as we all have come to expect, Samsung brings smart features to each of their appliances. The Smart Care smart phone feature detects issues with the washer and offers you quick solutions. The WW22K6800AW's dryer counterpart features a wide range of drying options, including automatic Sensor Dry. The Samsung DV22K6800EW is a vented electric dryer which is quite rare among compact dryers, as most of them are ventless. For an even newer compact washer, the WW22N6850QX offers an upgraded smart feature called the Q-Rator. The Q-Rator is a laundry assistant which allows users to monitor washing action, plan their next wash, be alerted of issues & get troubleshooting solutions. Q-Rator even offers washing cycles and options for your specific fabric types, all within the Samsung smart app. Blomberg, another European company with extremely high-quality products, focuses exclusively on compact sizes for its line of washers. As a fun fact, Blomberg is actually owned by a Turkish company called Arçelik, the 3rd biggest appliance manufacturer in the world. Blomberg uses vented drying in their dryers, and they’re an industry leader in heat pump technology in the US. The Blomberg WM98400SX2 is the best compact washer they offer. But if you’re going to understand and consider purchasing a Blomberg, it’s important to understand that they don’t conform to the ‘fancy-named functions’ that other apartment size washer and dryer sets market. They pride themselves on operating, washing, and drying flawlessly without unnecessary bells and whistles. Their machines feature Automatic Temperature Control that adjusts the temperature to keep it steady during wash cycles, protecting your clothes from overly cold or hot temperatures. The Automatic Water Adjustment system fills the washer with enough water for current loading so that no water is wasted. All Blomberg compact washers can be stacked with dryer pairs, and thanks to the Unbalance Detection System, if the laundry causes over-vibration, the washer won't allow the fast spinning process in order to protect the washer & dryer. Last but not least, this Blomberg model boasts 16 wash cycles with special functions to cover all the soil types & fabrics. The Blomberg DHP24412W is Heat Pump Ventless Electric dryer and can be stacked with the WM98400SX. Since it is a Heat Pump dryer, it is 50% more efficient than standard electric condenser dryers. It offers 11 drying cycles and enough volume to fit up to 13 towels in its 4.1 cu. ft. capacity. For more in-depth information, please check out our Blomberg Washer & Dryer review. Korean technology giant LG is known for its unique designs and innovative technologies. They certainly keep this trend going strong for their appliances line. Currently they have only one compact washer model available, but it's no surprise that it is a hugely successful one. Besides its solid and durable construction and great washing performance, the LG WM1388HW brings along a bunch of smart features that we should mention. NFC Tag-On technology allows users to download new wash cycles from the internet and transfer them to their washer with a tap of the phone via wireless NFC technology. What it means is that you'll of access to a ton of washing programs for every type of fabric and soiling. You'll also enjoy the SmartDiagnosis™ feature, which allows any problems to be diagnosed directly through the smartphone. We should also mention other great features, including the TubClean Cycle that cleans and sanitizes inside of the washer, plus 6Motion™ which offers alternative tub motion options for increased washing performance. 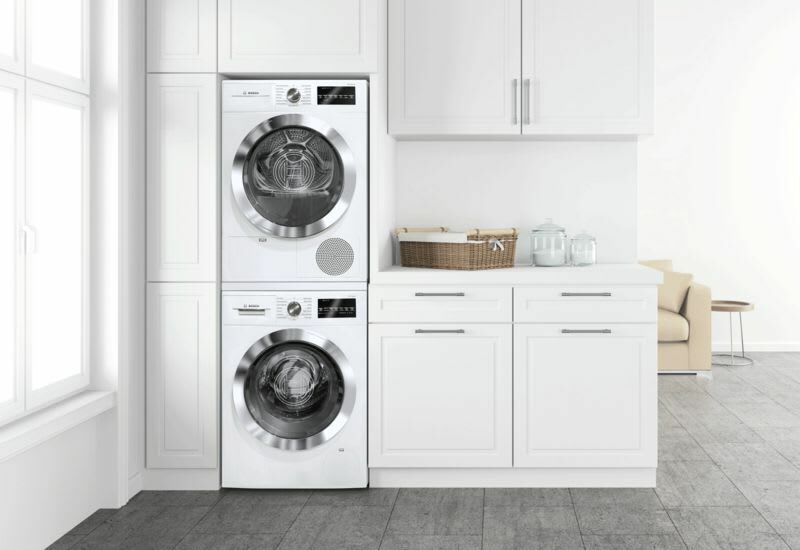 Like all other washers in this article, LG WM1388HW features a stackable dryer partner, the LG DLEC888W Compact Ventless Condensing Dryer. It comes with all the smart features of the washer, plus a Sensor Dry option that recognizes whether the laundry is dried completely. It prevents over-drying and protects fabrics from unnecessary wear. NOTE: LG models do not ship with hoses or cables, so you'll need to purchase these separately. Sweden based multinational technology company, Electrolux, is well known for producing appliances with a very high value/cost ratio. They're the dependable budget alternative to higher-end brands like Miele. With that in mind, it's no surprise that this compact washer from Electrolux, the EFLS201TIS, is a huge success and rated very highly by various evaluators. The Electrolux EFLS201TIS boasts excellent washing performance. It cleans perfectly using 14 different wash cycles. It also offers a deep clean sanitization cycle that removes 99% of bacteria and 95% of common household allergens! Meanwhile, thePerfect Steam™ Wash System releases steam from the bottom of the machine. Steam rises up automatically, penetrates into fabrics and removes hard stains without damaging the clothing. The 2.4 cu. ft. capacity is more than the so-called 'standard' 2.2 cu. ft. capacity for most compact washer and dryer sets. Overall, it's a very very good washer that you can confidently choose without hesitation. The Electrolux EFLS201TIS compact washer's stackable dryer counterpart is the ventless electric dryer known as the Electrolux EFDE210TIS. It has 7 dry cycles including a fast dry option for your urgent needs. Tumble can turn both ways, so your clothes come out with a minimum of wrinkles. Be sure to note that it's a condenser dryer, not a heat pump dryer. Finally, both washer and dryer offer reversible doors, giving you flexibility whenever and wherever you place the machine. NOTE: Electrolux models do not ship with hoses or cables, so you'll need to purchase these separately. The Fisher & Paykel WH2424F1 is one of two compact washers available from the brand, and offers more features than its cheaper sibling the WH2424P1. The WH2424F1 has FabricSmart™ technology to better protect your fabrics, and uses steam to get rid of stubborn soils. A special Woolmark™ cycle provide safe cleaning for your valuable wool laundry. The WH2424F1 is also powered with SmartDrive™ technology which reduces vibration and noise. Overall, it may not reach the same level of quality as Miele or Bosch, but Fisher Paykel has done at least a solid job in constructing a dependable washer. The WH2424F1's stackable dryer partner is the ventless DE4024P1. It's a condenser dryer with an auto drying option that prevents energy waste. Fisher & Paykel also included a drying rack for sensitive items that are too valuable for tumbling inside the machine. GE Appliances were once owned by General Electric. Its headquarters are still in the US, but recently Chinese manufacturer, Haier, bought GE Appliances. GE is constantly developing innovative technologies, and besides their relatively budget-friendly apartment size washer and dryer sets they also offer full-size washers and dryers. Currently GE features two compact size front-load washers and one compact size top load washer in its washer line. The GFW148SSLWW is a 2.4 cu ft capacity compact size washer and has the largest capacity among all GE Compact washers. It comes standard with 14 wash cycles, which is more than enough to cover all types of soiling. This compact washer also features a Steam function which penetrates deep into the fabric and softens the hard soils without damaging your laundry. Like most of the GE Washers, GFW148SSLW features a custom cycle known as My Cycle. My Cycle allows customers to save their own cycle parameters (adjusted time, temperature and intensity) and use it later with one touch. GE GFT14ESSLWW is the compact, ventless, electric dryer from GE and can be paired with the GFW148SSLW. It features 4 cu. ft. of capacity and an HE Sensor Dry feature which prevents clothes from over-drying. GE Compact Dryers are condenser dryers, which means they are less efficient than Heat Pump dryers. You can check out the associated compact stackable electric dryer set on our website to find out more. Asko is a Scandinavian company known for bringing together dependable functionality, efficiency and eco-friendly design, and a visual aesthetic that involves clean lines and modern inspiration. Their belief is that great appliances and products are all about making lives easier and better, and they bring a distinctly Scandinavian approach to their craftsmanship and the use of gorgeous natural materials whenever possible. The W2084W is a titanium-finished, brand-new design from Asko for 2018. It features a program for every unique need as well as three different modes—Normal, Green, and Intensive. These modes are all easily and quickly adjustable, letting you choose between more intense washing power and environmentally friendly efficiency. The W2084W also features a 1400 RPM motor, left hinge door and up to 17.6 pounds of wash load in its 2.1 cubic feet of drum space. The ActiveDrum Technology provides advanced care and gentleness thanks to a distinctive drum shape and design. Other features include the Quattro construction that allows the door to be sealed directly onto the drum without protruding into the washing space. Other features of the W2084W include an easy-ready LCD display, 15 wash programs and a stainless steel drums. As far as downsides, this model doesn’t feature a bleach dispenser and can be known for longer-than-average wash times. As for its counterpart, the T208VW vented compact dryer, you can expect short drying times and energy saving auto programs, as well as one specifically designed for bedding. A special drum design with six ball bearings allows for ultra-smooth drum operation with reduced noise and long lasting durability. Other features include an easy-to-use lint trap and a Front Filter that helps protect the condenser and tumble dryer from lint. And with the unique Anti-Crease Mode, you can tumble clothes after the drying cycle is complete to avoid creases and wrinkles. If you have a small space for your washer and dryer set, it doesn't mean that you have to compromise on quality, features, or durability. As apartment size washer and dryer sets come into ever greater demand, more and more companies are producing world-class compact machines that rival their larger counterparts in every metric. By doing your research, and knowing what you want out of your compact washer and dryer set, you're guaranteed to end up with an advanced, powerfully effective washer and dryer set that fits in whatever compact space you have in mind. Well, within reason. No company has yet released a washer dryer set that fits directly inside your dresser or clothing drawers, saving you an entire step altogether. But until they do, you have a wide range of apartment size washer and dryer options at your disposal.